Here is a subscription box that is a little different than any others I have reviewed in the past. Vinyl Me Please is a record of the month club that sends special edition LPs pressed exclusively for Vinyl Me Please members. US : $27 monthly (month to month) -$25 monthly for 3 months - $23 monthly for 1 year subscription. International: $44 monthly (month to month )- $40 monthly for 3 months - $38 monthly for 1 year subscription . I received products from past 2 boxes for review just so that you get the idea of what to expect. I like a wide variety of music and I am always on the lookout for music that I listened to in the past and also always looking for new music I have never heard of so I was very happy with this selection that Vinyl Me Please picked for the past 2 months. I love the prints and the posters. I thought the cocktail recipes are a nice touch because I like drinking cocktails once in a while. I was comparing prices and the subscription boxes are at a decent price so if you like a variety of music and are always looking for new vinyl records to add to your collection, I think this is a great subscription box for you. I do highly recommend it. 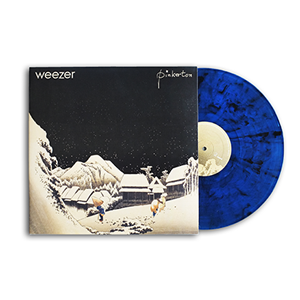 I absolutely Iove Weezer and look at the gorgeous record. I so want to get my hands on that one. Don't you?